We’ve expected for a couple of years now that 2013 would be a big one for the Jordan 5. We’ve also counted an all Elephant print colorway among the releases for this 23rd anniversary for some time now, but today we see a new detail that suggests further expressions of a core theme. The Air Jordan V ‘3Lab5’ gives us a new nickname via sample tags and shows off a periodic table-inspired embossing on the inner tongue (lined in premium leather) that references ‘El’ as the third element, synonymous with 1988’s AJIII. Will we see a 4 ‘Ce’ with the IV’s Cement Grey speckles, or perhaps the V’s own ‘Sh’ with the sharkstooth on another numbered Jordan? 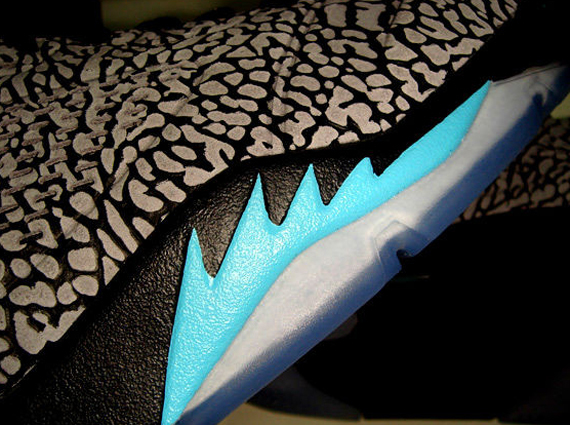 Stick with Sneaker News to find out where this Lab series is going, and most importantly for now, the 3Lab5’s release date.